Remakes: The funnel type cup has been embellished with twelve slightly twisted solid glass spiked gadroons, typical for glasses from Venice and of that time. The paraison got at the bottom side a second layer of glass and was subsequently formed in a dip mold with vertical ribs. The Venetians call this technique mezza stampaura. The bottom of the cup is of solid metal. The final decoration looks like a Corinthian column decoration with its leafy like spikes. The stem of this glass is a so called “a jambe” stem, see ancientglass.wordpress.com example 7 in the category stem formations. The cup has in addition a small full glass “bubble” to reduce the content even more. Stem and foot are connected thru a merese which Bill Gudenrath calls a “sock”. The foot is slightly conical. This type of glass is known as a deceptive glass as the guests cannot see, when the glass is filled, that the capacity of the toastmaster’s or landlord’s glass is basically a fraction of the size of the other companion glasses used in an event. Such an event could be a distinctive dinner or another get together where the glasses are frequently raised to drink to the occasion or to the person(s) of honor of that event. The toastmaster can keep his wits so to say thanks to his special glass. 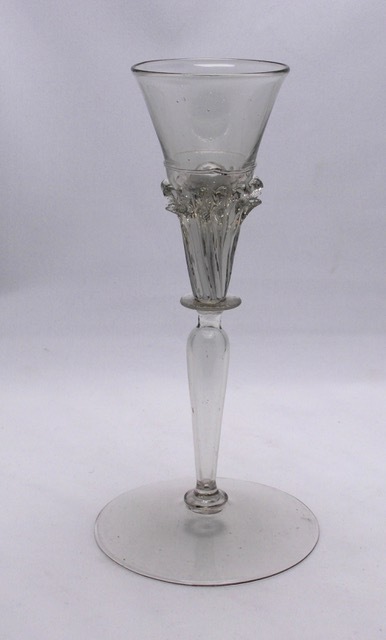 A toastmaster’s glass like this one is an early Venetian example of this type of glass. Later on, toastmaster glasses albeit almost most of those not of the deceptive type, became quite popular ie. in England like the example shown in this posting, glass # 32 see below, or the well-known Dutch “pijpensteeltjes”. (see glasses # 1 and # 17 see below) Of course, these glasses could also be used as sweet mead glasses, or for other alcoholic “refreshments”. The tall slender stems also enabled the “drinker” to get let’s say wine to the mouth overcoming the barrier of the lace like or pleated fine cotton “millstone” collars not spilling the wine on those fancy accoutrements while holding the glass by the foot. Origin: Venice, end 16th early 17th century. H = 16,2 cm. ; ø cuppa = 5,2 cm. ; ø foot = 8,2 cm. ; weight = 74,1 grams. No direct parallels found yet.